BCS Stone Surface Innovations are Concrete Polishing Contractors Raleigh has been offering unique, decorative concrete flooring options to homeowners and businesses in the Raleigh area for over 10 years. Concrete polishing has become an increasingly popular flooring option in recent years due to its sleek, colorful look that can be obtained at a fraction of the cost of more expensive choices such as carpet, marble, wood, granite, or tile. Nothing can match the smooth, attractive, modern appearance of a polished concrete floor. Polished concrete floors not only give you a great look at a great cost, but they are also environmentally sound. Because concrete does not contain VOCs (Volatile Organic Compounds), you can enjoy improved air quality with a polished concrete floor. They reflect up to 30 percent more light, which means the room will require less light to illuminate and less energy to heat – and that will save you even more money in the long run in addition to the initial cost savings. All the chemicals we use are LEED (Leadership in Energy & Environmental Design) friendly. We use Prosoco/Consolideck to give you the best polished concrete floor possible. 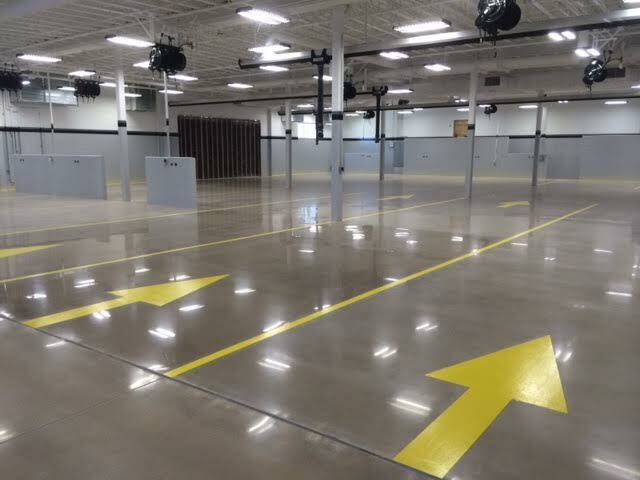 In addition to the number of homes that we’ve serviced in the Raleigh / Durham metro area, more and more commercial sites (especially large warehouses) the low cost and energy savings as well as the low maintenance included with our floors have made polished concrete a more frequent choice among commercial and industrial sites, especially large warehouses. If you are looking for a stylish floor that is both affordable and low maintenance, BCS Stone Surface Innovations Concrete Polishing Contractors Raleigh can help. We are a licensed contractor. Call us today for a consultation!